This is a 2.4kw diesel powered generator, with a heavy duty roll frame, electric start, battery holder, and leads. Built to work in rough conditions, this model meet industry safety standards as required by Australian Mining and Construction. 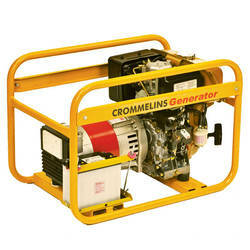 This model is suitable for applications where diesel power is required over petrol. It is hard working, has high torque, is low maintenance, and has a long life. Customise this model specifically to your needs. Some common specifications include Hirepack and Minespec. Australian assembled generator with a Genuine Subaru electric start industrial engine with sealed battery, heavy duty steel roll frame, brushless alternator, 2 year manufacturers warranty and a 3 year Subaru/Robin engine warranty.